I’m going to let you in on a little secret (and I apologise right now to all you die hard fans)… I am sooo sick and tired of hearing the words ‘Fifty Shades of Grey’! Every time I turn on the TV or flick through a magazine, I hear or see those 4 words. 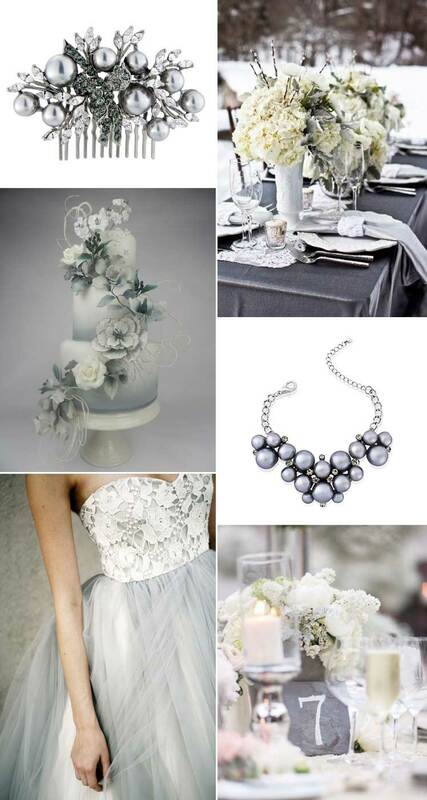 As many eagerly await the imminent and much anticipated film release, let’s do Fifty Shades of Grey the innocent way with a look at one of my all-time favourite wedding colour schemes. I have always loved grey, even before it was cool to. I tend to favour lighter shades of the grey spectrum and, because I’m a girlie-girl, I love coordinating with hints of light rose pink or even moody blues. I know lots of brides worry that it’s a colour that’s too masculine for their big day and I fully agree that dark, steel tones can appear quite cold or industrial, but mixed with white or prettied up with blush or a pastel shade, grey is quite possibly one of the classiest colours. Let’s be honest, opting for a charcoal wedding dress is definitely going to make a dramatic statement but the majority brides aren’t going to want to wear such a dark shade on their big day. If you love the idea of a grey gown but still want a more traditional style, the answer is pale dove grey – super flattering to practically every skin tone, soft and dreamy. Perfection! One word of advice; if you do go for a light shade, make sure there is enough depth so it’s apparent you’re wearing a gorgeous grey gown rather than dirty white! When it comes to flowers to complement your grey wedding theme, ask your florist to incorporate succulents, green-grey foliage and berries to contrast against white or soft blush blooms. For a more dramatic look, deep red flowers contrast amazingly well and, if you adore the glamour of Gatsby, incorporate grey feathers to achieve a beautiful vintage 1920s look. For a chic minimalist reception, grey is the must-have shade but it doesn’t mean you can’t make it glamorous or pretty. Mixing in silver and pewter metallic details with cutlery and candlesticks or a sparkly sequin table runner will instantly create a luxurious feel, or go for crisp white table linen with a light grey table runner and napkins and an abundance of beautiful blush flowers to take your wedding style to an ultra-pretty status. Unless you prefer a very contemporary look, I’d suggest incorporating ruffles, flowers or an intricate pattern into a grey wedding cake design to add a hint of stylish romance and softness. I’m not a huge fan of ombre but I’d make an exception with a grey cake as it really does give an effective lighter illusion and carries through the theme particular well if your bridesmaids are wearing shades graduating in depth.